In 2009, Mike Decher was seeking funding options as part of a proposal to re-establish his Police Department's K9 Unit. Funding options seemed to exist for the initial purchase of the dog and training through federal and state grants, and funding grants from private organizations but not much else. The only other organizations that existed were those that donated only K9 ballistic vests or organizations that specifically fund certain departments ("Friends of..... K9 Unit"). Word of the K9 Unit proposal spread through the department and eventually got to some of the citizenry. There were but all had two things in common, first was lots of paperwork and the second was back end reporting requirements. as a charitable non-profit organization after the failure to reestablish a municipal police department's K9 unit. Sometimes good things come from failure. The good thing in this circumstance was that a substantial amount of money was earmarked by private donors for a department that essentially "refused to take a handout". Those donors were staunch supporters of law enforcement and believed that the use of specially trained dogs in law enforcement provided positive and overwhelming results. They requested that their money be donated to other K9 teams that needed the financial assistance in the local area. After a bit of research, it was discovered that the needs of most of the K9 units in the suburban Philadelphia area were not being met by their municipalities. An overwhelming majority of the teams contacted related they continued to seek funding for their basic necessities such as food and vet care, in addition to funding for ongoing training and replacement of equipment. One K9 Handler related that he had been raising funds for at least a year to replace his department owned vehicle that was 6 years old, had over 150,000 miles and repeatedly overheated thus making it unreliable and most importantly, unsafe for the Handler's partner. While that was the most surprising, it was clear that the needs of these teams was so much farther reaching than offering to purchase them only a ballistic vest. The easiest, though not most reliable, way to find information was via the internet. Hundred's of searches revealled at the time that there was no organization in the nation dedicated to providing these important and necessary crime fighters with what they truely need. Sure there are organizations that exist to provide ballistic vests to law enforcement K9 teams, and private organizations dedicated to specific departments/units, but nothing to help support the majority of teams currently in service. 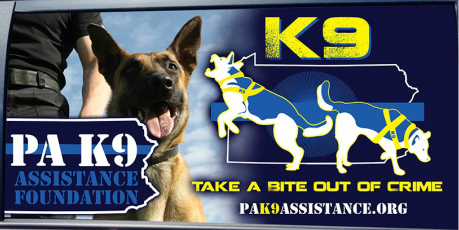 Since our establishment, PA K9 Assistance Foundation has provided equipment to K9 teams throughout the Commonwealth of Pennsylvania.